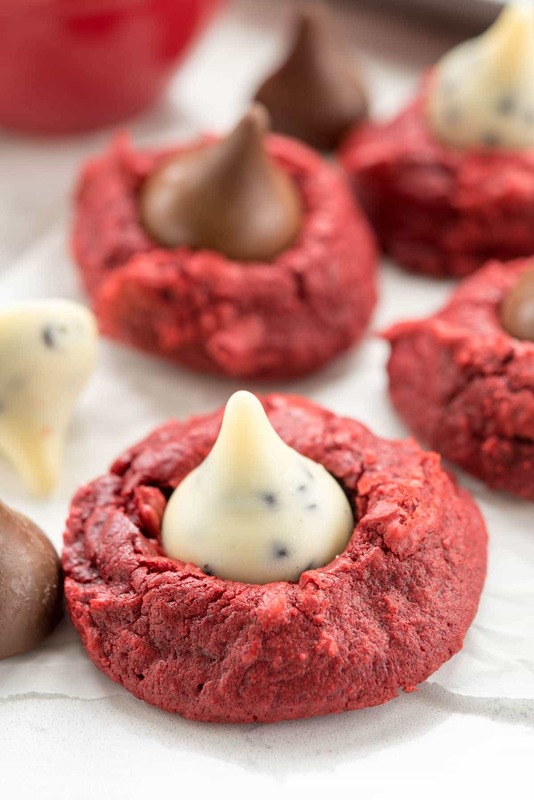 Red Velvet Blossom Cookies are easy to make with red velvet cake mix and Hershey’s Kisses! These are the perfect holiday cookie, especially for Valentine’s Day. Both my parents worked when I was a kid, so up until third grade I went to in-home daycare. There were two of them, the first was before I was five and don’t really remember much, except that the lady was awesome and we remained friends with the family until after I was out of high school. That’s where, at the tender age of three or something, I learned to change a diaper and I got married to the boy I napped with (they figured I slept with him, so we should be married). If you have kids the same ages as your charges, they MUST play together. And if your daughter makes the babysittee play the dog in a game of house, it’s perfectly fine. Toilet paper squares MUST be torn straight across. No jagged edges are ever allowed! If you leave a jagged edge, you will be required to go repair your infraction. Red and pink do NOT match and should never be worn together. Now, I really don’t understand that last one. Red and pink not matching? Ridiculous. I mean, if red and pink didn’t match, what would we wear on Valentine’s Day? The themed holiday industry would probably implode on itself. 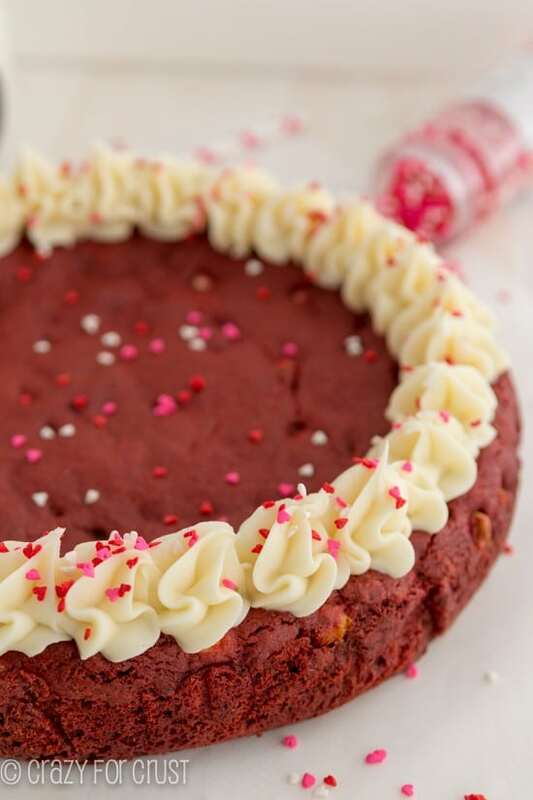 Red Velvet Cookies might not be a thing if it wasn’t for red and pink on Valentine’s Day!! 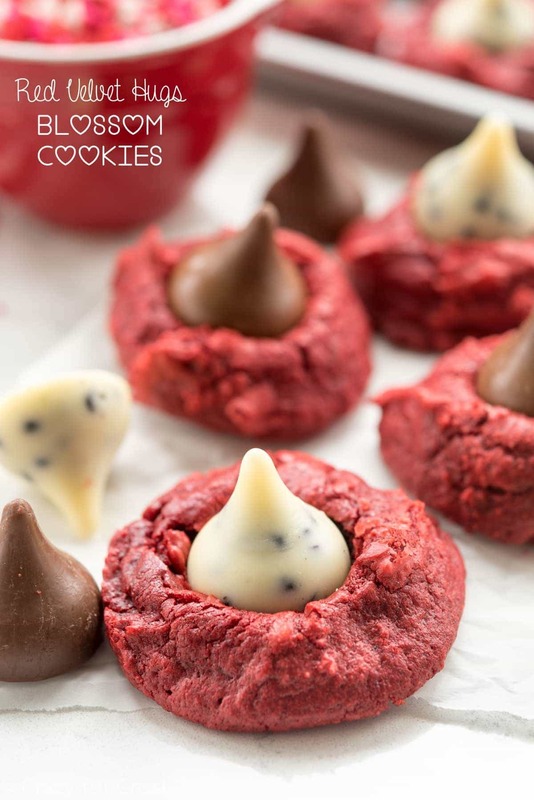 If you’re in the Valentine’s Day mood, these Red Velvet Blossom Cookies are the perfect treat! They’re made easy with cake mix and Hershey’s Kisses with only 4 ingredients! Really, that’s it. Just three ingredients to make a basic cake mix cookie. Four if you add in the Hershey’s Kiss! These cake mix cookies are made with Duncan Hines red velvet cake mix, but you can use any brand (or any flavor). I much prefer making cake mix cookies with butter to oil, but my secret to making an easy cookie is melting the butter. That way you don’t even need a mixer: just stir! Blossom cookies are such a classic recipe but they don’t always have to be peanut butter; you can make them any flavor easily when you use a cake mix. Chocolate Blossom Cookies would be fantastic too! The other thing I love about making Hershey’s Kiss blossom cookies is that you don’t have to stick to traditional milk chocolate kisses. They have so many flavors now you can use any one you want. 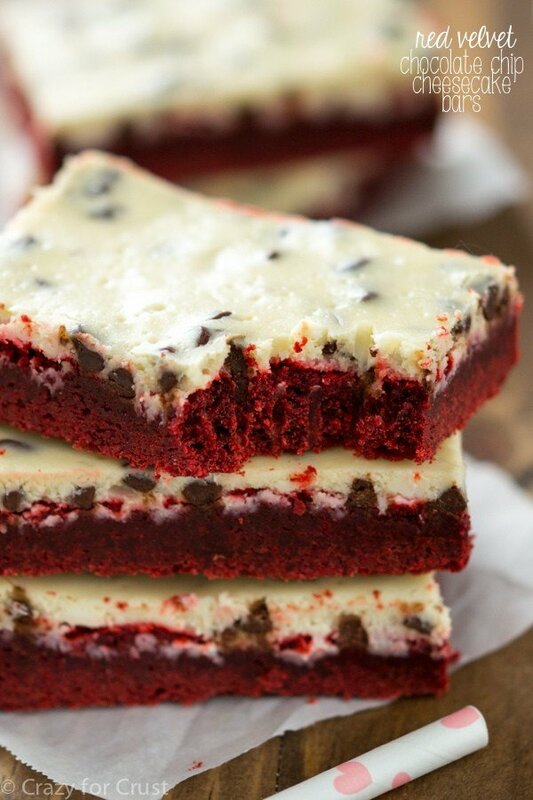 Cookies ‘n Cream or the new truffle ones would be fantastic with these red velvet blossom cookies. Cake Mix Blossom cookies with just four ingredients are a cookie lovers dream recipe! Turn blossom cookies into red velvet hugs!! 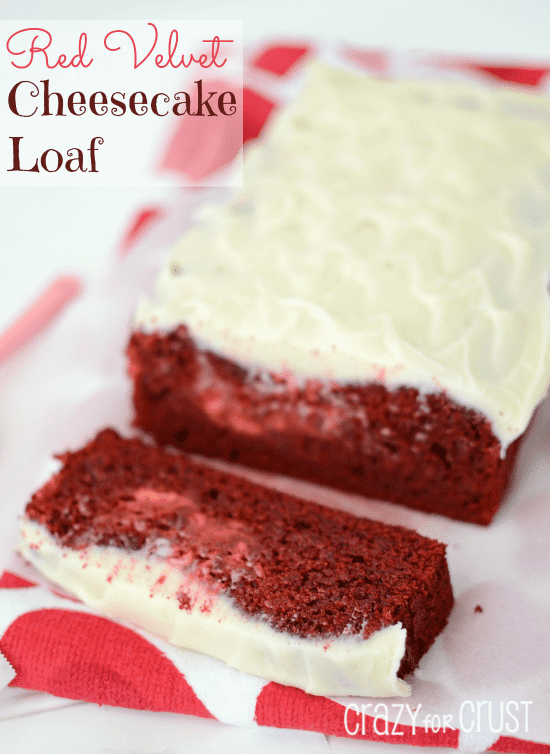 This easy cookie recipe starts with a red velvet cake mix and bakes up in no time. 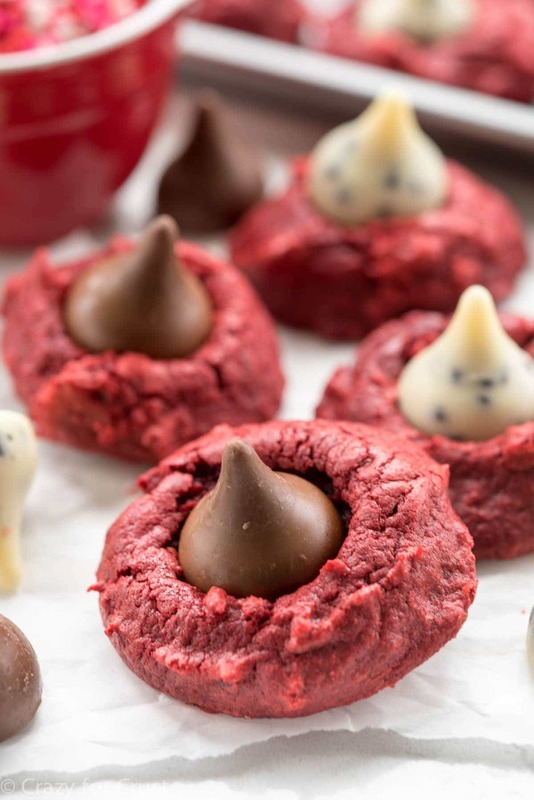 Place a Hershey's Kiss on top and make them a blossom cookie! Preheat oven to 350°. Line cookie sheets with parchment paper or silpat baking mats and set aside. Mix together cake mix, eggs, and butter using a hand mixer or stir it by hand. 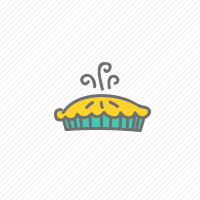 The dough will be thick. Scoop 1 tablespoon sized balls onto your cookie sheets. Chill for at least 30 minutes. If you bake them right away they'll spread just a bit too much. Bake about 8-10 minutes until tops just start to crack. Err on the side of underdone! Immediately press a Hershey's Kiss onto the top of each cookie. Let cool completely. Store in an airtight container up to 3 days or freeze for up to 1 month. Use any flavor cake mix and any flavor Hershey's Kiss!